He was one of the legal giants of the Washington area, a former president of the Virginia Bar Association, an acknowledged dean of the divorce bar. 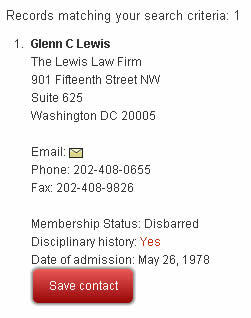 Now, lawyers around the region are wondering: Where is Glenn Lewis? Now Lewis, 59, has mostly vanished from the legal scene. His spacious law office in downtown Washington has closed. He has been accused recently of taking clients’ money, doing nothing for them and refusing to return the money. After a sheaf of bar complaints was filed against him, he did not respond to a Virginia State Bar subpoena, and last week his law license was suspended. He faces legal judgments of more than $1 million. His house in Oakton has been foreclosed upon. Finally last week, Lewis filed for bankruptcy. Summary of Action: In a reciprocal matter from Virginia, the D.C. Court of Appeals imposed identical reciprocal discipline and disbarred Lewis, effective immediately. In Virginia, Lewis was found to have violated rules relating to neglect, failure to communicate with a client, charging an unreasonable fee, misappropriation of entrusted funds, failure to respond to disciplinary authorities, a criminal act reflecting adversely on attorney’s fitness, and dishonesty. Glenn C. Lewis , once one of the Washington area’s highest-paid and most-respected divorce lawyers and a former president of the Virginia Bar Association, has been disbarred for dishonesty, mismanaging clients’ funds and failing to fulfill his legal obligations, according to a state bar ruling. 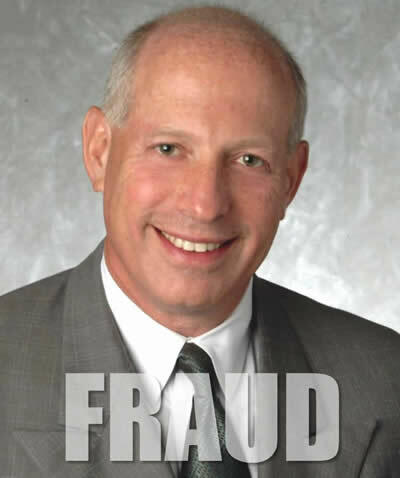 One of Washington’s top divorce lawyers, Glenn C Lewis, has found himself disbarred for charges of mismanagement of client funds and dishonesty, ending the career of a man who was once at the pinnacle of the divorce lawyer community.